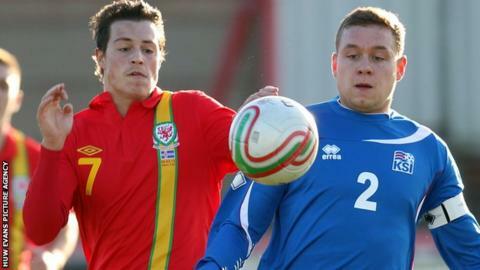 Three late goals secured victory for Wales Under-21s over Iceland in a friendly at Llanelli's Stebonheath Park. Debutant Wes Burns broke the deadlock on 78 minutes when he chipped the goalkeeper. Williams added a second goal two minutes later before Robert Ogleby wrapped up the win with a tap in. It was Wales Under-21s first victory under manager Geraint Williams, who succeeded Brian Flynn last summer. Williams handed caps to seven new players ahead of the forthcoming 2015 European Championship qualifiers. Wales are in the same group as Stuart Pearce's England, Finland, Lithuania, Moldova and San Marino.